Good afternoon. My goodness, I'm late getting started today. Sleep wasn't coming to me during the night. I would put on the light and read for a while, and then try to sleep again. Nope, no sleep. However, by the time daylight was breaking, my body finally drifted off to sleep. Today is sunny and cold. Only 25F degrees. Tis a great day to work on my new blog book. My coupon runs out tomorrow so I need to get hustling. 38% off is a great coupon, and I'm not one to pass up a great coupon especially when I'm planning on buying the product anyway. Yesterday I did not go out to shop because daughter Deanne called to say that she was going shopping and would pick up some things for me. So I stayed in and started to read my new book. 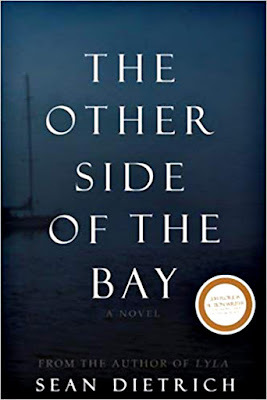 "The Other Side Of The Bay." This book was written by Sean Dietrich. It's a mystery that takes place in the Panhandle, and I have to say that I thoroughly enjoyed the book. If you want it, you can find it on Amazon. Sean has written several books, so now I'm looking to buy another one. This time I think I'll get "Lyla." I may just get this one in Kindle form. I do prefer an actual paper book, but I don't really have lots of room to be collecting more books. 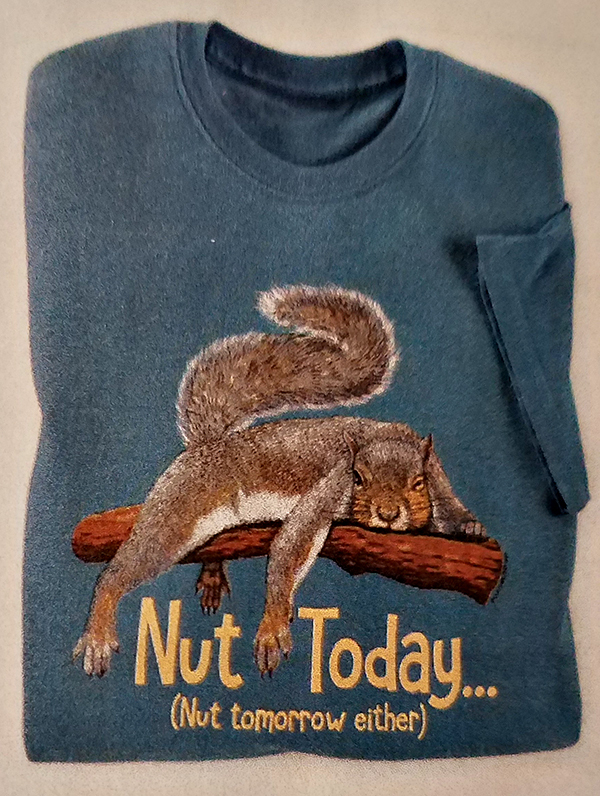 One of the catalogues that I get has the cutest tee shirts. The next time this catalog comes in the mail, I'll take a photo of it to share in case anyone wants to subscribe to it. Here is one shirt that I think is just adorable! This picture reminds me of myself. This is why I don't get things done in the time frame that I set. Can you tell I love the squirrels? Yes, they are really pesky, but they are so darn cute to watch. Today's mail brought more catalogues and the memory wire that I purchased from JTV a few days ago. Later today I'll try to gather some ideas on how to use this memory wire. First, I want to tend to my blog book. My feet are beginning to feel a bit like popsicles. There is only a crawl space beneath the floors in my part of the house, so when the temps go way down like this, the cold seems to come right up through the floors. I guess I'll put on my long fuzzy socks and turn my little heater on for a while. One of the catalogues that came in today's mail is the "Burgess Spring 2019 Garden Catalog." I don't know why I love looking at these catalogues. I can't get out and do the garden work anymore. I'm thinking that I might hire someone this year just to tend the gardens for me. Well, I think I'd best sign off now and get started on a few things around here. The first being my blog book. So, till tomorrow, Y'all have a fantabulous day.